Keep kids busy in the Bible with this bumper book of Bible stories and 250 stickers. Ideal for children aged 4-7. In the Big Bible Sticker Book, best-loved Bible stories are combined with over 250 stickers to help keep little fingers busy and make the book their own. 31 well loved stories from both the Old and New Testaments are retold for children in this bumper sticker book. Questions and activities involving stickers are then included to help children engage with the story in a way they can understand. The beautiful illustrations throughout provide lots of points of interest for parents to talk through with young children, and help create a sumptuous feel to this book. 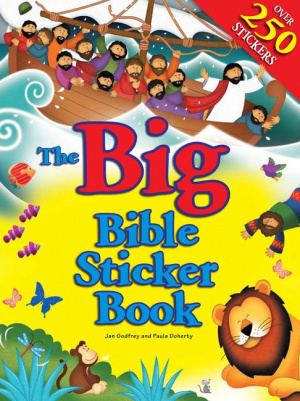 The Big Bible Sticker Book by Jan Godfrey was published by Authentic Media in April 2017 and is our 661st best seller. The ISBN for The Big Bible Sticker Book is 9781860249785. Be the first to review The Big Bible Sticker Book! Got a question? No problem! Just click here to ask us about The Big Bible Sticker Book.